I spent one Sunday afternoon going through what may become the standard resource guide for self-publishers, particularly of e-books. The Self Publisher’s Ultimate Resource Guide, Every Indie Author’s Essential Directory to Help You Prepare, Publish, and Promote Professional Looking Books by Joel Friedlander and Betty Kelly Sargeant provides essential information for writers wanting to self-publish. Between them, the two writers have over 50 years of experience in the publishing business. Sargeant is the founder of BookWorks, the Self-Publisher’s Association. She also writes a monthly column on self-publishing for Publishers Weekly. Friedlander is a book designer and blogger. He is the creator of Book Design Templates. The book is divided into three sections, Prepare, Publish, and Promote. Each section comprehensively provides chapters that cover detailed sources for each area. Sources are provided in alphabetical order and include name, phone number, e-mail address, web-site address, and a brief description of services offered. Among the listings under Prepare are content and development editors, proofreaders, indexers, covers and designers. Services offered include writing software and associations. Writer’s conferences for 2015 includes conferences large and small in states and cities throughout the country, including my home Alaska. In Publish writers will find companies from India to Ohio, and websites that provide information on eBook conversion, print on demand, and subsidy publishing. The Promote section covers every aspect of book promotion from website design, to book blog tours, marketing and publicity, and sites to list books. This directory will be of particular benefit to self-publishers with deep-pocket budgets. But, for boot-strap self-publishers most of the professional services are priced beyond their budgets. However, even writers with small publishing budgets will find some helpful information. For example, in the e-Book conversion section is a link to James Calbraith’s two blogs, “Formatting an eBook in 10 Easy Steps.” Associations provides information about many writer’s groups new writers may not know even exist. Some of these groups, such as BookWorks provide a free membership and offer many valuable services, such as listing writer’s published books with no cost involved. On the whole the resource is a good book. But, I hope the next edition makes two major changes. The book opens with over five pages of book endorsements that become redundant and distract from the purpose of the book, to provide useful information for self-publishers. And one would expect a book written by a book designer to have some elements of design to make it appealing and easy to read. Unfortunately, design is lacking in this directory. Everything is printed in the same font and style, with the same amount of spacing. This lack of differentiation between the title or name of a professional service, and no space between an e-mail address or website diminishes the ease of using the book. For example, when trying to click onto a website, my e-mail compose page opened. Bolding the titles of services, providing space between websites and e-mail addresses and highlighting them in blue, and putting information about services in italics would make reading the directory easier and more pleasing to the eye. But, even with the lack of good design, this resource does earn it’s name as the ultimate resource guide. Each annual publication should show improvement in design, new and updated resources to benefit self-publishers. 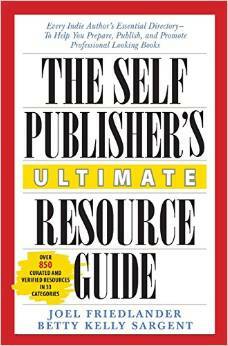 This first edition, is a good beginning and a valuable resource for any self-publisher.